In one of my forays to the Couth Buzzard, my venue for trading my old books for credit and possibly buying new-books-to-me, I found this book. The Blue Hen’s Chick, an autobiography by A. 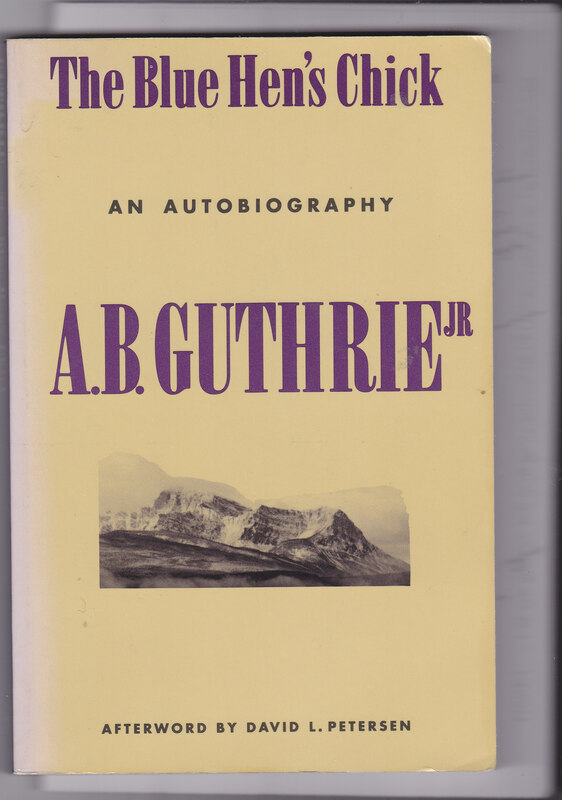 B. Guthrie, Jr., the author of The Big Sky and The Way West, among other works of merit. This book hit a chord with me in 3 very specific ways: one, A. B. Guthrie Jr. was awarded a Nieman Fellowship to attend Harvard University in Cambridge Mass. in 1944-45. I was 8 years old, living in the next town. With his family he spent 2 nights in the Hotel Commander there in Cambridge – the Hotel Commander where I used to visit my Grandfather and his sister, known to the family as Auntie. While at Harvard he associated with many eminent professors and particularly one Frederick Merck – that man’s son was in my class in high school and is very active still today in convening the reunions of our high school class. Third, in the early 1950’s Mr. Guthrie attended the Bread Loaf School of English near Middlebury College in Vermont. 1954-58 was my vintage at Middlebury. I just love finding other people with similar memories and associations. 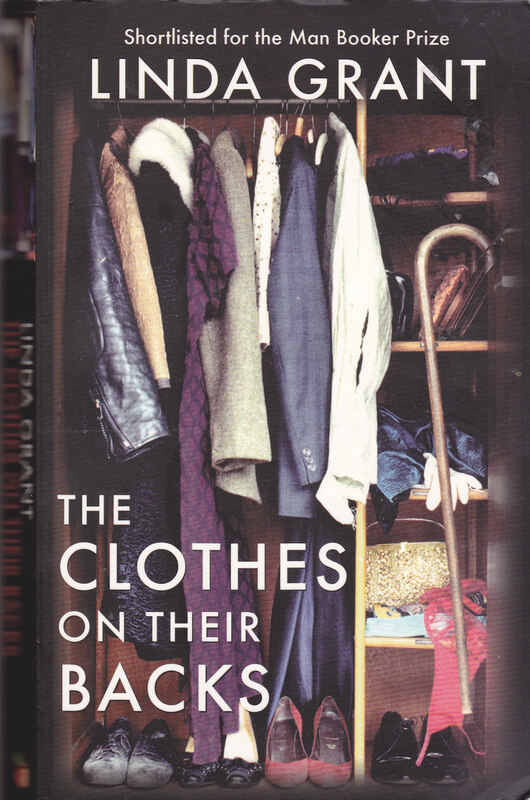 The Clothes on Their Backs by Linda Grant. Linda Grant is an author that I like. According to the Wikipedia entry she is a British novelist and occasional journalist. i.e. She writes novels and occasional other pieces. It is her novels that I have read mostly. The novel pictured above I found on the shelves of Oxfam in Dundrum in Dublin and it has since been sitting on my shelf or shelves on both sides of the Atlantic just waiting to be read. It along with about 100 other books. The line of “unreads” doesn’t seem to diminish at all although I am nibbling away at them. The problem is I tend to keep buying more books before I have read all the ones I already have. 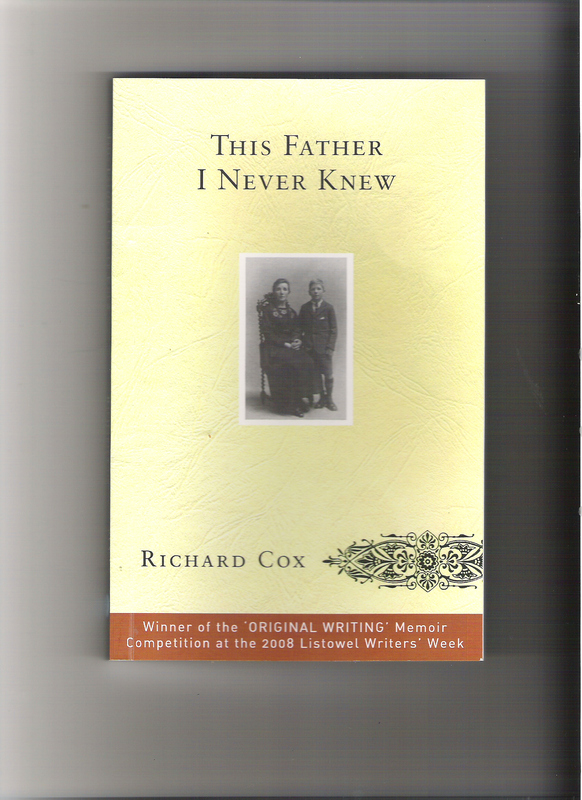 This book seemed to fit in with what I have been trying to write myself, namely the research into my family history. So as a break from my writing and fiddling with photographs I spent an enjoyable hour or so finishing this Linda Grant book. My family history doesn’t have much in common with Linda’s but still, the idea of memory and place and the confluence, if that is the right word, of family members all contribute to the inspiration for writing. Here is the cover for the little booklet I am working on. Inspired by Grandson Kyle’s family tree, that’s kind of the line I am taking. 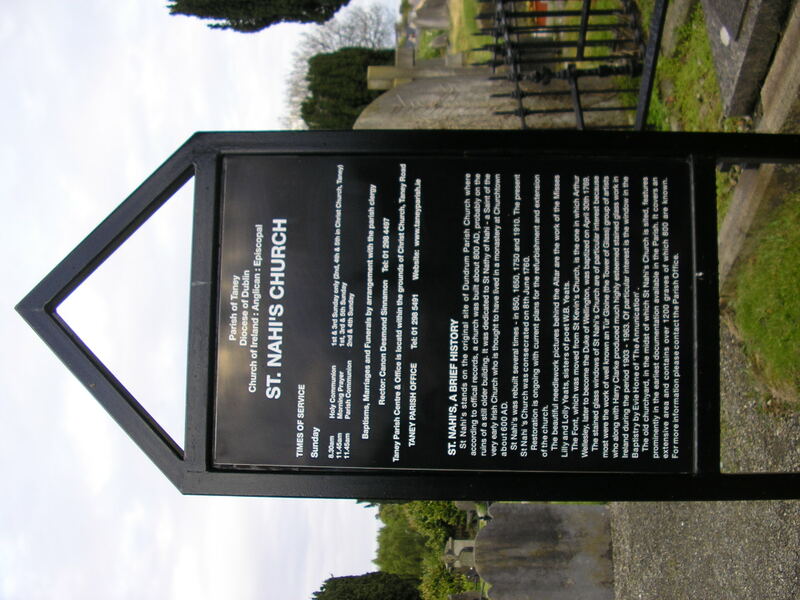 Most of the material has already appeared in my blog posts under Family History. I am just recrafting it for hard copy to be printed, probably for limited circulation to family members. This is the spin-off from that autobiography I’ve written and have been trying to work up into more readable form. 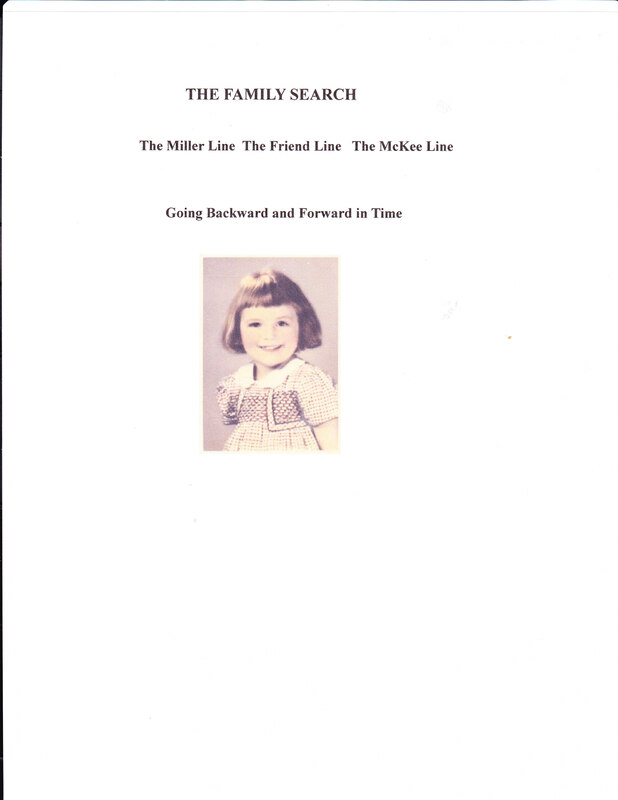 In addition to The Miller Line and the Friend Line in the Genealogy I find that since I’m at the center of this little booklet and I do get married, now I have added The McKee Line – and I haven’t written very much yet about the genealogy on that side of my life. For Kyle’s project we did find quite a few photographs so I should be able to cobble something together. 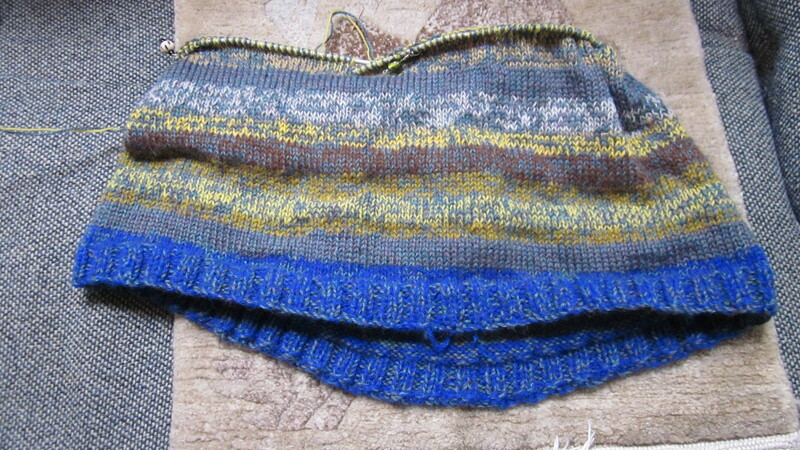 And as part of this show and tell, I’ll show you my current knitting – another jumper. 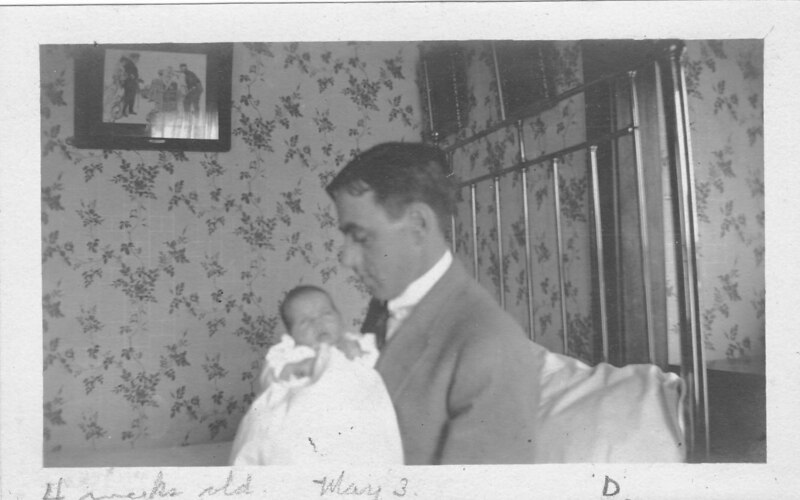 My father was born in 1891. 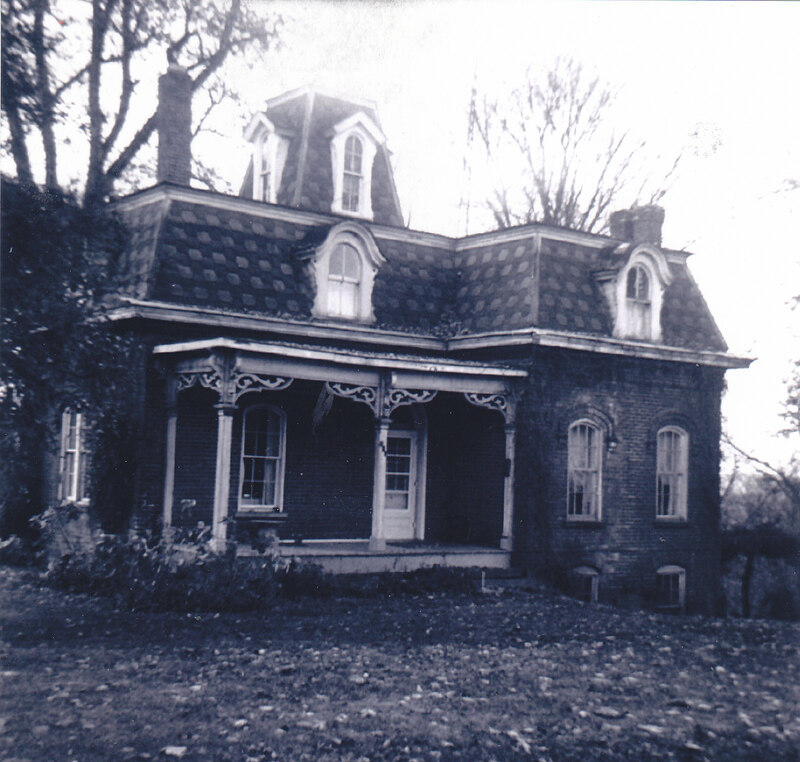 He was one of 5 children who grew up in this house on Buena Vista Hill, Newark Ohio – photo taken 1960. By coincidence my sister Nan spent a year in Newark from March 1960-1961. At that time, a relative of my father by his first marriage, contacted my sister and told her where my father had lived in his youth. So my sister went and found the house and took this picture. One thing she remembers my father telling her was that in the winter the children used to go sledding and his older sister would pretend to be hurt and need to be pulled back up the hill. And one thing I remember is that when the children had been naughty their mother made them select their own switches from one of the fruit trees so that she could punish them accordingly. My impression is that she was quite a mild person and I would like to think that she was strict but that her punishments were not too severe. There were 3 boys and 2 girls to try to keep in order. Her husband, my father’s father, died in 1897 leaving her with the 5 children to raise. I asked my sister what our grandmother did then to support the family. Nan said that Grandma would have had my grandfather’s Civil War Pension. And she worked at Newark County Court House, presumably doing office work. Eventually the children grew up and dispersed but I don’t know at what point the house was sold and my grandmother went to live with her daughter Myrtle who was living in Raleigh North Carolina. 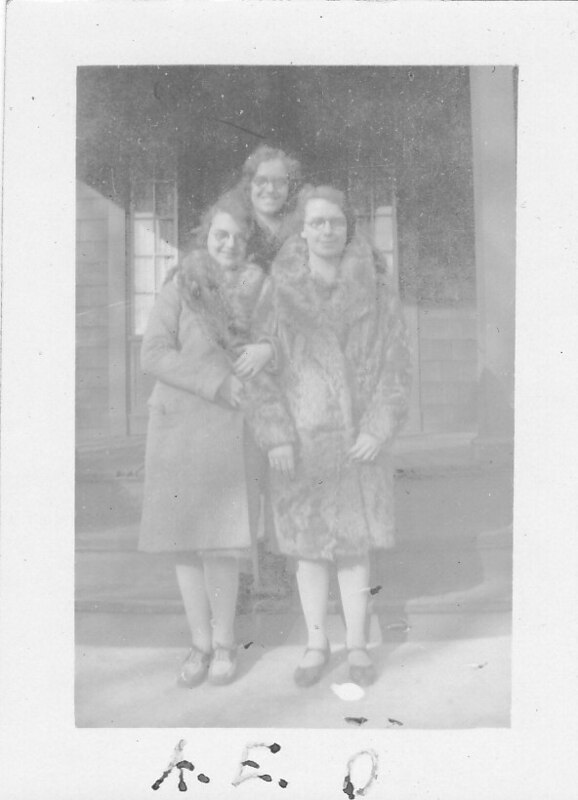 The oldest daughter, Aunt Ruth, was in Indianapolis Indiana, twice married but no children. This is the research thus far on those early years on that side of the family. Those unknown aunts and uncles and cousins. 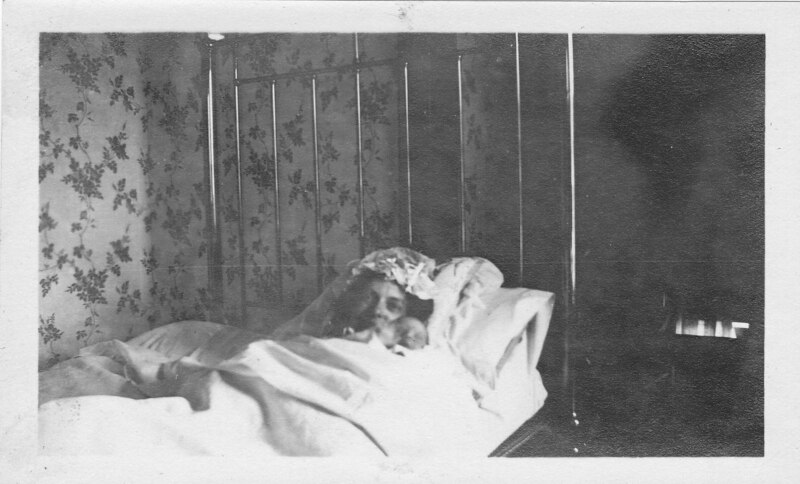 I have been scanning photos of my maternal grandparents. 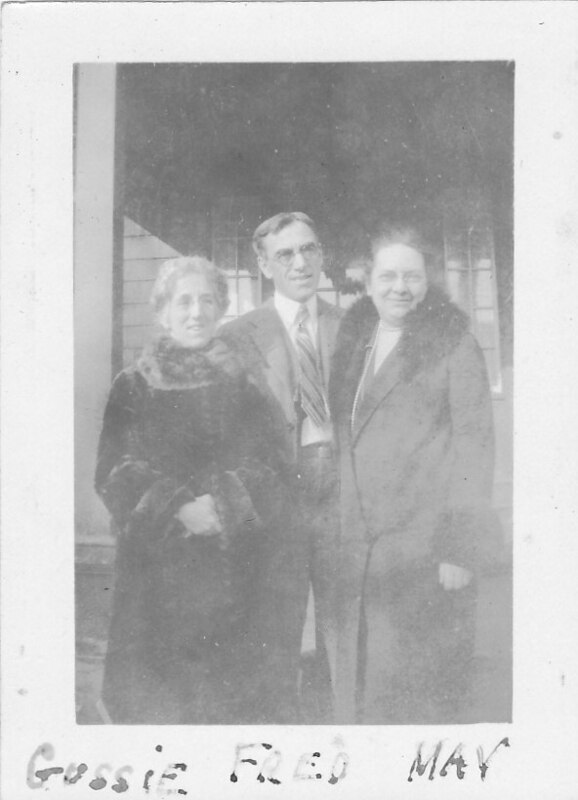 They were married in 1906, had twin girls in 1907, another daughter (my mother) in 1912, and another daughter in 1913. Here are a few of the photographs of the young family. What is particularly interesting to me is that in these young faces I can see the more mature adults that they eventually became. But I find this hard to write in that one of the twins did not even reach adolescence. Even though I of course never knew Aunt Elizabeth’s twin sister Helen, still the sorrow of this young family on losing one of the twins hurts. The loss of a young life is so poignant. Diptheria was a common cause of death in the earlier part of the last century and that is what I have been told happened. Four daughters then became three. 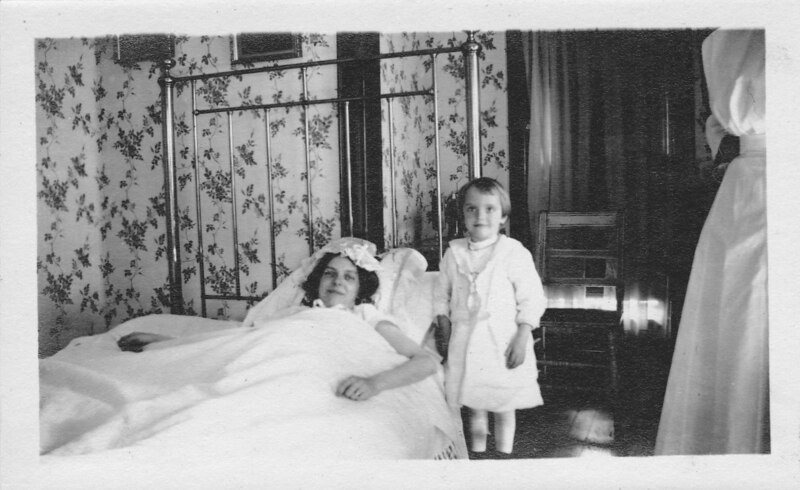 Now today in 2010, Aunt Alice, the one surviving member of this once-young family has passed her 97th birthday. The above photos were part of my mother’s “archive” which I found in her home in Hawaii after she passed away 10 years ago in 2000. I took (or sent) the photo albums back to Dublin, saved them in a chest in our garage there, and then last year sent them back across the Atlantic to our new home here in Seattle. Now I am making the time to examine and preserve these treasures. One of the albums belonged to my greataunt (my grandfather’s sister) who lived with the family. 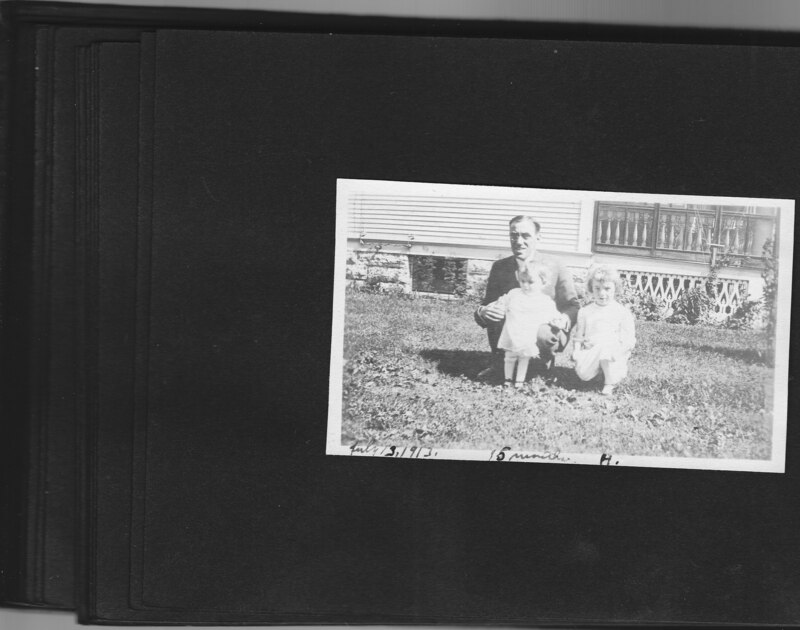 There is a little label in the front of the album showing that they lived on Capitol Avenue in Omaha Nebraska. I know my mother was born in Minneapolis. So far I haven’t been able to establish exactly when they moved from Minneapolis to Omaha. As regular readers of this blog know, I am working on my memoir/autobiography 8 countries, 62 years. Here is another memoir which I discovered in the poetry section of Easons here in Dundrum. 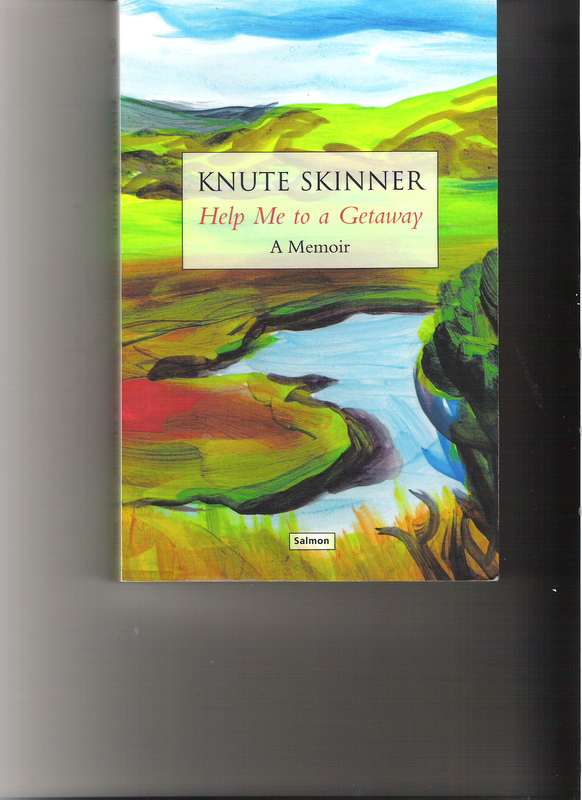 Knute is mainly a poet, but it is his prose and his memories which held my attention. Knute is American and has shared his years between Ireland and the U.S. But the memoir is mainly about his travels in Europe in 1958-59 when he sailed from New York on a student ship to disembark in Cobh Ireland and spend time in Ireland, Denmark, London, Paris, and Spain. Approximately 10 years later I travelled to Europe, not by ship alas – in 1959 I flew from New York in a 4 engine propeller aircraft operated by Flying Tiger Airlines, with stops in Halifax Nova Scotia, Gander Newfoundland, Shannon, and finally London. I was only coming for 2 months, as opposed to Knute’s intention of spending the rest of his life on this side of the Atlantic. He wanted to write poetry; I wanted to bicycle. What sold me on this book early on though was to discover that he had attended the Bread Loaf School of English – well known to graduates of Middlebury. My travels took me not only around England and Scandinavia by bicycle, train, bus, and ferry, but also south through southern France and northern Spain and up to Paris via a friend’s newly purchased VW. Knute’s experiences a few years earlier in southern Europe and Paris, as well as his experiences in Ireland and London and Denmark made for very nostalgic reading. 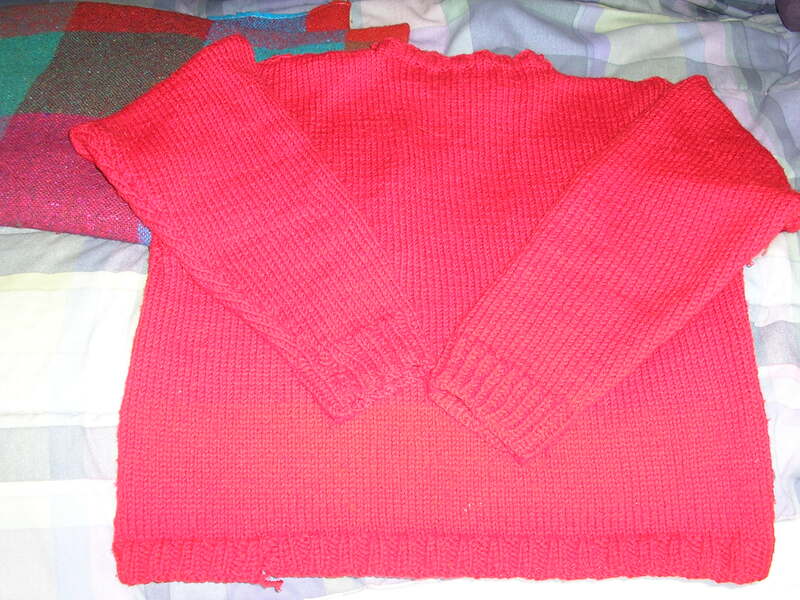 I knit this sweater a few years ago and I have worn it a lot. Yesterday I happened to be looking at the cuffs and realised that one sleeve had a cuff knitted knit one, purl one – the cuff on the other sleeve is knit two, purl two. Does it matter? I don’t think so since it has gone un-noticed until just now. Regular readers of this blog know that I like to read memoirs and other works of such ilk. Here is an excellent one which I finished last night. 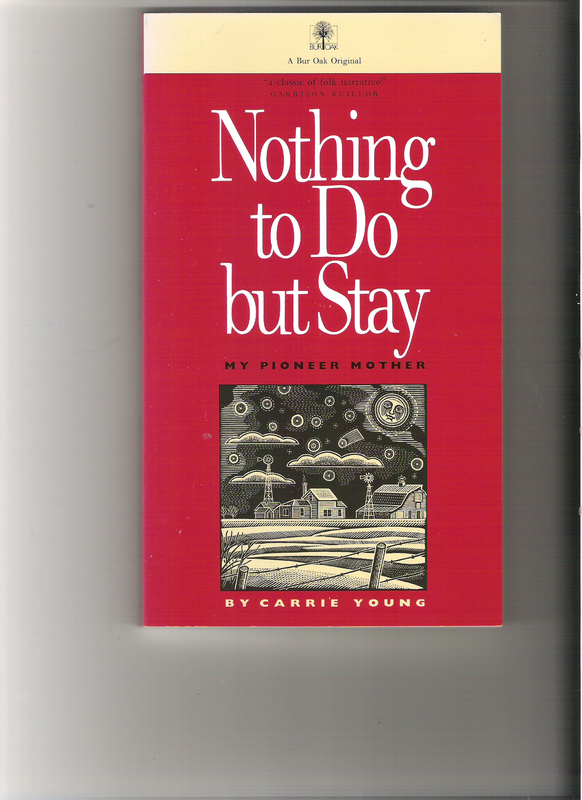 Nothing to Do but Stay, My Pioneer Mother, by Carrie Young. A book I found in the Scandinavian Store on 15th near our home in Seattle. 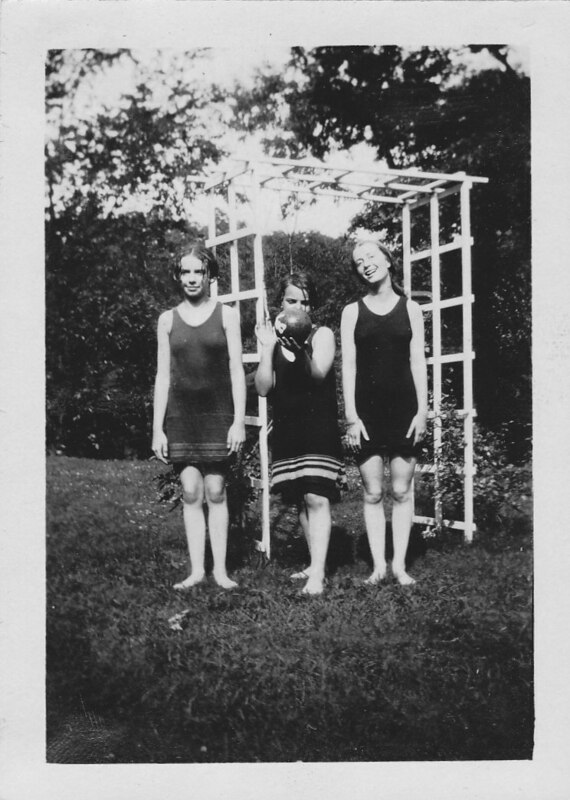 This book is a collection of essays about Carrine Berg, 1879-1962. Carrine came to America from Norway at the age of 3. She grew up in Minnesota and went on to homestead in North Dakota. She would have been of my grandparents generation. The essays are fascinating telling of family life in the middle west at that time in history. Carrine was a very skilled seamstress, and no doubt a knitter as well. She was anything but absent-minded. Her story comes through as of a pioneer woman of sturdy stock and one to be greatly admired. Now to get back to the editing of my own autobiography. Here we go. Today I had an appointment with a publisher to talk about my manuscript. I have been wanting to publish this for quite a while – the working title is 8 countries, 62 years. Well, the 62 years is now 73. But I want to publish what I wrote 10 years ago. Another publication could catch up with the intervening years. So now I must get down to really doing the editing of my manuscripting and finding photos to go with it. Alas, some of the photos I would use are in Seattle, but I think I can find enough here to be going on with. It would be good to tidy this off before our final departure from Dublin. After all, 42 of the 73 years have been based here. 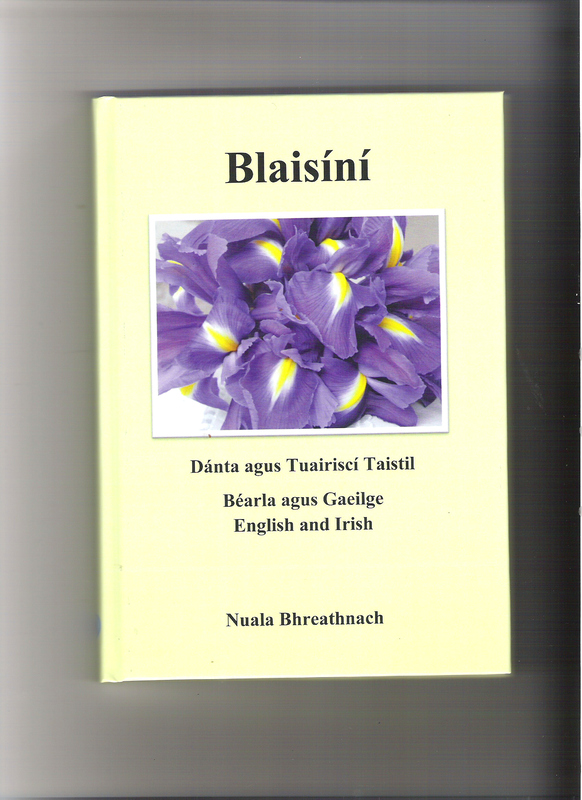 I attended the launch of Nuala’s book last night. 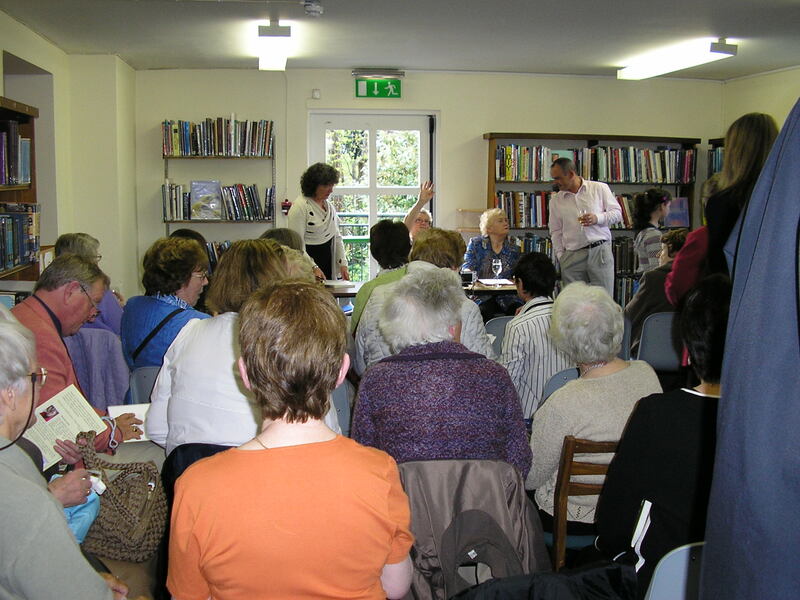 A wonderful occasion in Dundrum Library. Our Irish teacher opened the proceedings with a nice introduction and then Nuala read a selection of pieces from her book. Congratulations to both Nuala – and Richard – for seeing their work through the publication process and into print available to a wider audience. The publisher of these 2 books is Original Writing. 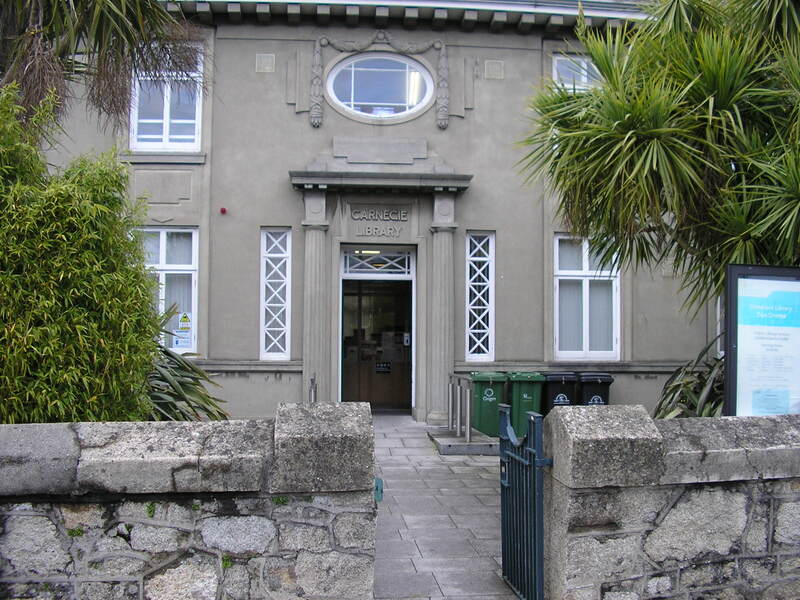 This is a self-publishing firm, mainly for Irish writers. They have over 150 publications in their “store”. The launch table, our Irish teacher Maire Fitzgerald on the left, Nuala in the center. 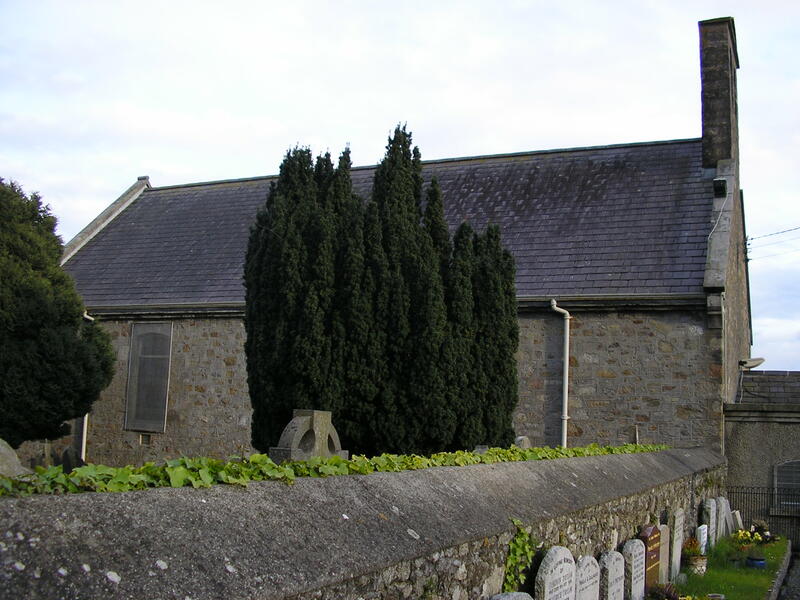 After the launch it was still bright and I had a wander up the hill to a very old church – St. Nahi’s. But I’ll tell you more about that another time.